Cranberry juice (CJ) contains a remarkably high concentration of polyphenols, considered to be beneficial for cardiovascular and bone health. 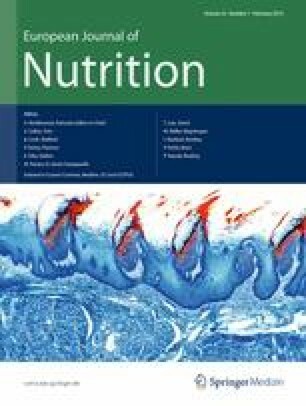 The current double-blind, randomized study was designed to test whether daily consumption of double-strength Ocean Spray light CJ (2 × 230 ml) over 4 months has beneficial effects on vascular function and on endothelial progenitor cells (EPCs) carrying the osteoblastic marker osteocalcin in particular. A total of 84 participants (49.5 ± 16.2 years) with peripheral endothelial dysfunction and cardiovascular risk factors were enrolled in this double-blind, randomized, controlled trial (69 completed the 4-month protocol—32 in the CJ group and 37 in the placebo group, respectively). Vascular responses to reactive hyperemia were measured non-invasively by peripheral arterial tonometry (EndoPAT). Peripheral blood mononuclear cells were stained for EPC markers, as well as osteocalcin, and counted by flow cytometry. Baseline characteristics were similar in both groups. The effect of CJ on peripheral endothelial function and on circulating EPC counts (CD34+/CD133+/KDR+) did not change during the study. A high percentage of EPCs expressed osteocalcin (59.4 ± 35.7%). CJ, as compared to placebo, induced a decrease in the fraction of EPCs expressing osteocalcin (−8.64 ± 48.98 and 19.13 ± 46.11%, respectively, p = 0.019). Systemic levels of the adhesion marker ICAM correlated significantly with the number of EPCs expressing osteocalcin. The study demonstrated that long-term supplementation of polyphenol-rich CJ did not improve peripheral endothelial function. However, the decrease in the fraction of osteocalcin+ EPCs suggests a potential beneficial effect of polyphenol-rich CJ. This study was partly supported by Ocean Spray®, USA, and partly supported by National Institutes of Health grants (grant number HL085307 for LOL and 5R01AG31750-2 and 5RO1HL92954-2 for AL). AJF was supported by the Walter and Gertrud Siegenthaler Foundation, the young academics Support Committee of the University of Zurich and the Swiss foundation for medical-biological scholarships (SSMBS; SNSF No PASMP3_132551).The trial was conducted using Ocean Spray® cranberry juice and placebo, respectively. AL is on the advisory board of Itamar Medical, and the other authors report no actual or potential conflicts of interest in connection with this study.